Organisation d'ateliers nature. Monotypes et Encres végétales. Lors de votre séjour, vous pouvez réserver votre atelier nature avec exposition instantanée animé par une intervenante diplomée nature environnement et histoire des arts spécialisée en pédagogie d'éveil. the donkeys and the lamas. 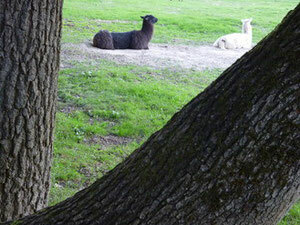 Here are two new additions to our troup, two out of our three magnificent llamas. They are both femail and are originally from Argentina. Our lamas are non working and are just to provide us with company and they do also provide lots of assistance with the upkeep of the grounds. 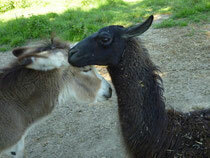 Llamas are south American camelid and are pro dominantly used for wool and as pack animals for mountain roads. Sometimes, due to their nature there are little disputes in the llama camp and this can lead to the llamas spitting at each other, the disputes don't last long and they never spit at humans. They wander freely around this meadows and without doubt, being very curious, they are always interested by you offering some natural food. We can also arrange excursions with the donkeys if you require. We have a small herd of donkeys, with new additions arriving, that are very tame and can help carry your luggage or even your children during your walks around the camp. You can have the option of using them by yourselves or we can accompany you if required. They are fun loving and always looking for company to promenade with. Bella is a magnificen trained donkey that loves nothing more than stepping out pulling her cart come and join her on her travels. We have two recent joinees to the herd thanks to 'mummy Bella' that we have a beautiful young female named Isis and thanks to 'mummy Kola' a handson young male named Athos. You can watch them daily playing and running through the parc. We are expecting another new arrival that is due to arrive with the nice weather. All of our donkeys have their own characters but all of them adore hugs, being brushed and the odd carrot from time to time. They are just waiting for new visitors! Children are welcome to help us look after the animals and the daily routines, this will help them understand the animals and get to know each one of them individually, an unforgettable experience.